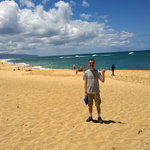 We went back to Hawaii - first Oahu, then Kauai! 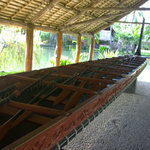 A warrior canoe from New Zealand. 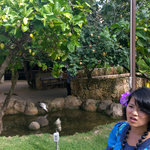 On the left is a noni tree, whose fruit supposedly has a lot of medicinal properties. (over the course of our trip we heard it cured everything from allergies to cancer) On the right is our tour guide, whose name I sadly didn't write down. 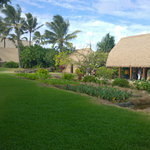 More of the Hawaiian village. 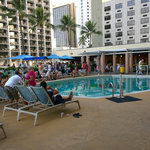 We learned how to dance the hula here! 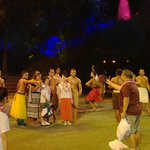 Dancing at the Tahitian village. 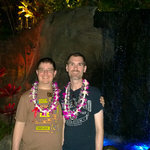 Us in front of a waterfall while we waited for the evening show at the Polynesian Cultural Center. After the show "Ha: Breath of life", the performers took pictures with people. They must have been incredibly sweaty - the show was very energetic! 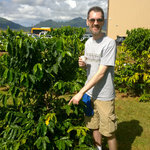 David in a coffee garden at Green World Farms. He's pointing to coffee beans! 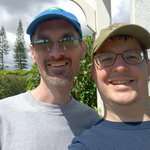 We took the Pineapple Express train tour at the Dole Plantation. 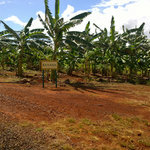 Here are banana trees! 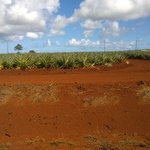 More fields of...something at the Dole Plantation. The red dirt made everything look very tropical! 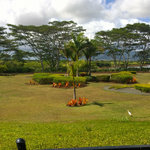 A nice grassy spot in the Dole Plantation. 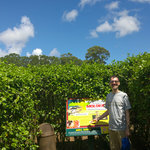 We're about to enter the World's Largest Hedge Maze(TM)! Even though we followed a map, it was surprisingly tough. David at the first(?) marker we found! 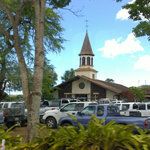 Each station was a different island of Hawaii. 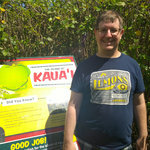 Me at the Kaua'i marker!